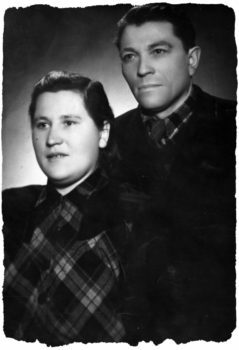 Kovno, Lithuania… 1941 – Soon after the Germans invaded Lithuania, the Jews of Kovno, including Maya Berelovich and her mother, Sheina, were forced into the city’s ghetto. Maya’s father, Itzik, had been killed when the Germans first entered Lithuania. Sheina was very active in the resistance, helping to smuggle as many children out of the ghetto as possible. Once outside the ghetto walls, the children were taken to a children’s home and orphanage run by Dr. Petras Baublys. Meanwhile, as she continued to smuggle children out of the Kovno ghetto, Sheina was trying to find a family with whom she could entrust her own daughter. In 1942 Sheina obtained false papers for Maya and gave her daughter to Jonas and Juzefa Fedoravicus, a Christian couple. The couple cared for Maya for a short time until neighbors discovered that Maya was a Jew and threatened to report Maya unless she returned to the ghetto. Eventually, Maya was again smuggled out of the ghetto, this time into the care of Sofia Aleknaviciene and her twenty-one-year-old daughter, Brone. Soon the family was hiding another Jewish child, Ludmila Shmuilova, who stayed with them until the end of the war. While Ludmila was able to stay with Sofia and Brone, it became unsafe for Maya to stay in the home. In order to care for Maya as best she could, Sofia and Brone smuggled Maya to another village, where Vladas and Teofile Kverdaravicius cared for Maya and kept her as part of their family until the liberation of Kovno by the Soviet army in August 1944. During an Aktion, Sheina managed to escape from the ghetto and sought shelter with Brone and her mother. Sheina remained with Brone and Sofia until liberation. After liberation, Sheina and Maya were reunited. Brone Aleknaviciene died in 2013.